I am trying to use TEXTJOIN across multiple sheets, IF a cell is is the same I would like it to return the value from another cell in all sheets that are associated with it. 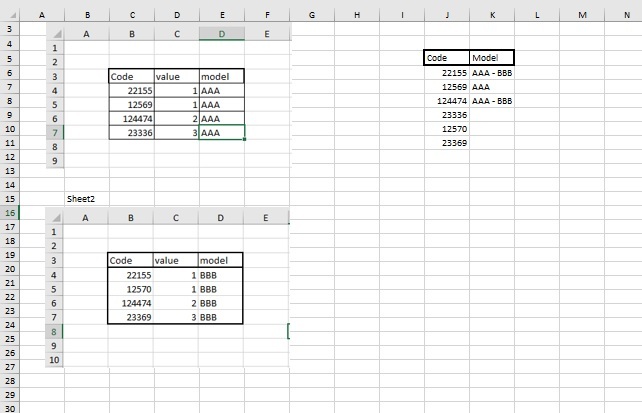 In this example, I am trying to look up the value on Sheet1 and Sheet2 for code in $B$4:$B$7 22155... and to retrieve the associated $D$4: $D$7 AAA and/or BBB and TEXTJOIN them " - ". I have tried TEXTJOIN and combining the IF and also VLOOKUP but my brain just can't seem to work it out. This will be along a larger range of sheets and 100+ CODES in each sheet. How to return cell address?